I am so happy to have our superb January Leading Lady, Stephanie Klauck, back for another appearance as our 3rd Birthday Bash special guest star. Stephanie is a sweetheart and so generous and giving of her time and talent! I can't thank her enough for joining in with our celebration. If you wish to see more of her w&w projects please CLICK HERE. She has an adorable clean and simple card with video for you to enjoy. Hello everyone! It's Stephanie here and I'm so excited to be back on the Winnie & Walter blog to help celebrate their 3rd birthday! 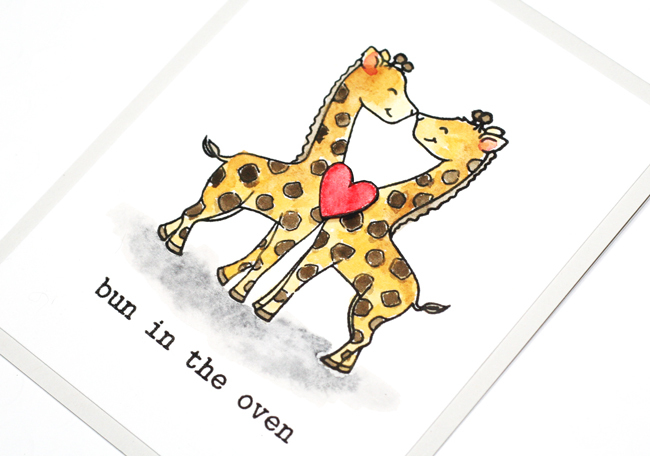 For my card today I used the adorable giraffe image from the new Big Hugs with Evelin T Designs stamp set to create a watercoloured, baby themed card. I stamped the giraffe image onto watercolour paper using Versafine Onyx Black ink and then I added colour using my Sakura Koi watercolours. I painted the giraffes in stages so I could let each of the areas dry before moving on to the next and I finished with the grey on the bottom for the ground. Once all of the watercolor was dry, I trimmed down the panel and adhered it to a grey card base. I added a red heart from the From the Bottom of my Heart stamp set (originally was a limited time free with qualifying purchase with our January/February 2017 Release and will officially be released later this year) that I watercolored with red and then I finished it with a sentiment from The Big, The Bold and the Baby stamped in black ink. Thanks so much for joining me on the W&W blog today! 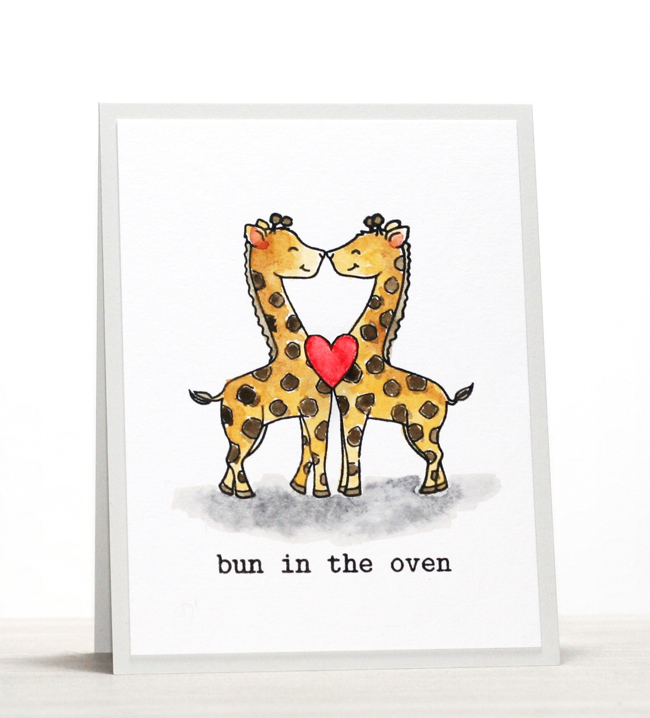 super cute card, really love how versatile these adorable animal images are for baby cards or love themed cards :) thanks for the video tutorial! Oh this is GENIUS!! LOVE!! Very cute card...love the little heart representing the new life. Very creative & so cute!